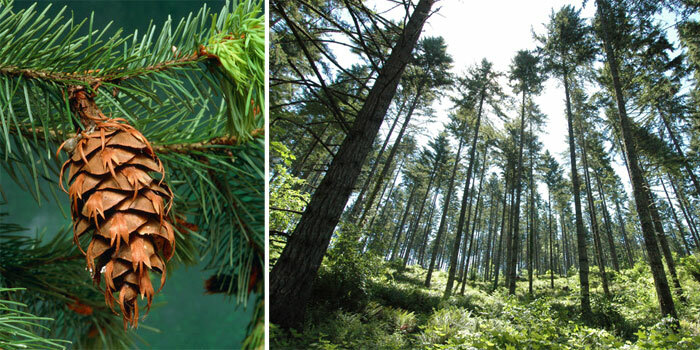 If you live in Oregon’s western “wet side” you are surrounded by a rock star of a tree, the Douglas-fir. If you live on the drier side of the Cascades, or even in the interior southwestern portion of the state: Fear not! Douglas-fir is there in large numbers too. In the western portion of the state, thick stands of Douglas-fir dominate the forests around us, but it’s not the only tree in the woods. Oregon has about 13 different kinds of forests that include leafy urban forests, ponderosa pine, mixed conifers, western larch and oak hardwood forests, to name a few. But it is the towering Douglas-fir that more often inspires, reaching heights second only to redwoods. In older stands, it presides over lesser trees in perfect harmony. In managed stands that carpet the western Oregon landscape, trees exceeding 100 feet are the norm. Douglas-fir is the emergent species after disturbance. That is its ecological role. Wildfire can destroy these forests, and wind can also topple whole stands of Douglas-fir that are not sheltered from storms that sometimes pound our coast and infiltrate our valleys. It is the emergent species because it loves the sun and, left to its own, would colonize about 80 percent of the landscape in western Oregon mountains and valleys after fire. Early settlers recognized the structural properties of Douglas-fir, which has great strength and beautiful, warm grain. Neighborhoods throughout the West are imbued with charm because this wood is so readily adapted to many styles and forms, and because it is available. The other day, my wife and I ate at a pizzeria housed in an old building. The joists and beams were made from what looked like 12”x16” Douglas-fir timbers that easily support this fine old structure. Later, I looked at the I-joists supporting our modern home. Certainly not the same thing, but still made of Douglas-fir and other composites because they are strong, lightweight and beautiful. The new library near my home is made largely from wood. It is the kind of place you want to visit and linger. The reading room is magnificent in part because the structural materials are made from composited Douglas-fir. If you want to learn more about this magnificent native species, visit OFRI’s online tree guide at OregonForests.org. You don’t need an MBA to understand that a shaky regulatory climate can have a damping effect on business. The threat of shifting regulations injects an unknown quantity into business planning that gives a business owner reason to pause before investing in new projects, new equipment or new people, all of which spell j-o-b-s.
That’s what’s happening right now with logging roads. Last year, the Ninth Circuit Court of Appeals reclassified logging roads as “point sources” of water pollution. The impact of that ruling could require forest landowners to get industrial discharge permits, typically required of factories and sewage plants, for each drainage pipe or rainwater ditch on thousands of miles of logging roads across Oregon. This is a network of roads and stream crossings that has seen tens of millions of dollars of investment to meet Oregon’s tough water quality standards. A permit system would impose significant new costs and expose landowners to legal costs associated with challenges and lawsuits. Congress approved legislation last year that temporarily prevented the Ninth Circuit ruling from taking effect. But hold on. That legislation expires Sept. 30. In the meantime, the Supreme Court is set to rule yet in June whether it will review an appeal of the Ninth Circuit’s ruling. Still confused? The U.S. Solicitor General isn’t. Though the SG agreed that the Ninth Circuit was wrong in its ruling, the SG argues that the Supreme Court should not review the Ninth’s decision because EPA and Congress are best able to resolve the issue. With exquisite timing, the EPA came out the day after the SG’s announcement to propose that it would manage forest roads under the Clean Water Act using state administered best management practices instead of industrial permits. In Oregon, that means the Oregon Forest Practices Act and associated rules. While an administrative solution could work, it would not provide legal certainty, which means the whole issue could end up in court – again. Of course, that does nothing for the beleaguered business owner, who’s trying to figure out whether to invest in new equipment and more people or start saving for expensive permitting. If you’re interested in learning more about the significant steps Oregon landowners are already taking to protect water quality in forest streams, I encourage you to view OFRI’s seven-minute video, “Oregon Forests & Water.” You can read more about it in our special report of the same name. Also, check out our section on laws and planning. Regulatory certainty – provided by either the U.S. Supreme Court or the U.S. Congress – would go a long way toward easing landowner anxiety and encouraging investment of the kind Oregon forest landowners have been making for decades. And that’s the kind of thing we need to get the U.S. economy moving again. "We do forestry right in Oregon, and we should all be proud of that." That's what Sara Wu, the director of the World Forest Institute, said when accepting the International Business Award from the Oregon Consular Corps (see story). What a refreshing comment. In an era where lawsuits against forest landowners still make headlines, Sara's comment is a great reminder of how far the forest sector has come. That's not to say we always get it right or there isn't more to learn. We're learning every day, and forest practices change to keep up with the times. As we built our new website, I was amazed to learn that the Oregon Legislature has amended the Oregon Forest Practices Act 20 times since it was first passed in 1971. And the Oregon Board of Forestry has modified the administrative rules and regulations dozens of times to meet the law's requirements. That means that as new science and experience have come to light, our citizen legislature and citizen board - as well as forest landowners - have embraced change to make sure we protect our precious natural resources for future generations. That the act has changed and become stronger is a sign of health. It shouldn't surprise anyone that forestry scholars from around the world come to Oregon to intern at the World Forest Institute, located at the World Forestry Center near Washington Park. Oregon is "ground zero" for advanced forest management practices. What we do here has influence far beyond our state borders. And that's something of which we can all be proud. This past weekend, May 19 and 20, kicked off Oregon’s summer recreation season. 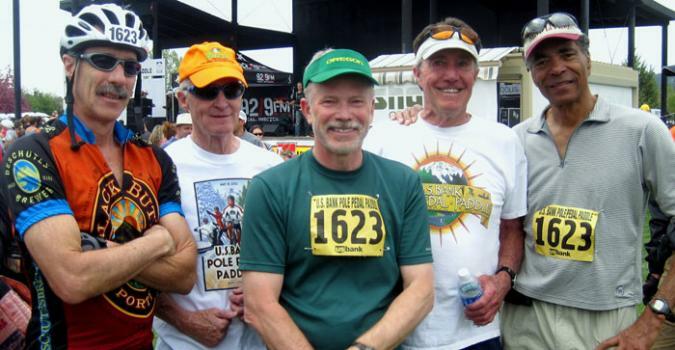 In Portland, 14,000 ran the inaugural Rock ’n’ Roll Portland Half Marathon. On the upper Clackamas River, more than 100 enthusiasts participated in what’s claimed to be the oldest rafting and kayaking competition in the Northwest. And in Central Oregon, where I was, the U.S. Bank-sponsored 2012 Pole Pedal Paddle attracted nearly 3,000 participants and thousands of spectators to Bend’s biggest annual event. Whether you ran through Tom McCall Waterfront Park, rafted the Clackamas River or bicycled the Cascade Lakes Highway, you experienced world-class fun. Oregon is practically the world capital of outdoor recreation. Oregon forests, mountains, rivers, streams and trails beckon visitors from around the world. OFRI’s new website helps those who want to experience Oregon firsthand. On our Get Outside & Experience page, you can get tips on hiking, camping, foraging, hunting and fishing, or exploring our forested urban parks. Foresters sometimes prescribe fire as a management tool to reduce fuel loads and avoid uncharacteristically severe fire. Particularly in the dry forest zone, which includes eastern and southern Oregon, fire acts as a natural thinning agent. Periodic burns contribute to overall forest health by removing smaller shrubs and trees, allowing the fire-resistant species to continue growing and helping prevent forest-killing fire. The bit of smoke wafting across Highway 20 reminded me of the importance of forest management. I appreciate the importance of wild, scenic and roadless areas where little human management takes place. But along travel corridors, around human populations and in forests designated for wood production, active forest management makes sense. I hope you have the opportunity to get outside and enjoy Oregon’s amazing forests very soon.